Jan Hus: Did You Know? Interesting and unusual facts about Jan Hus and his followers. Hus appeared before the world was ready for him. 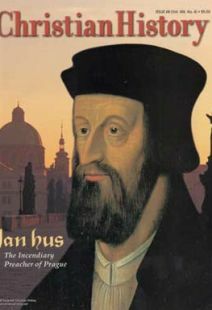 Jan Hus hoped his incendiary preaching and heated rebukes would purify a tainted church, but the flames consumed him first. As reformation divided Bohemia, it turned some of Hus’s most influential allies against him. Chronology of key events related to Hus and the Hussites. Jerome of Prague’s zest for life was surpassed only by his zeal for reform. Even in the midst of his campaign for reform, Hus never forgot the faithful flock back home. In De Ecclesia (The Church) Hus encourages Christians to trust God but question the Church. Hus held some of the same ideas as Wyclif and Luther, yet they were not all of one mind. The most powerful empire in Europe was no match for a peasant army led by a blind man. The integrity for which Hus died lives on among Czech Christians. Resources for further study of Jan Hus and the Hussites.